We've had a chance to do a full review of Amazon's intelligent speaker and smart home assistant Amazon Echo. 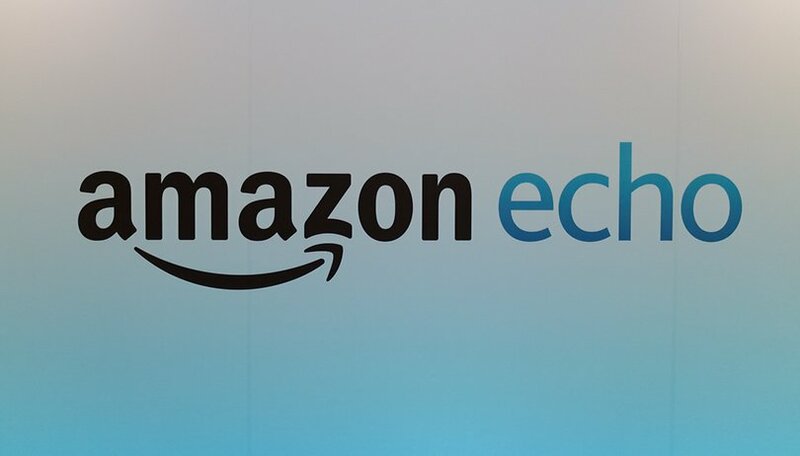 The Echo, and the smaller Echo Dot, are powered by Amazon's increasingly powerful Alexa software to bring voice control to your household. Find out more about these impressive products below. What are the differences between Amazon Echo, Amazon Echo Dot, and Alexa? The Echo and Echo Dot are, essentially, small voice-activated speakers designed to provide constant access to Amazon's virtual assistant, Alexa. There's no interactive display on them, instead, they are activated and manipulated with speech recognition using the trigger word 'Alexa', similar to how Google Now or Siri works. Sound is reproduced through a 360-degree surround sound speaker. What's the difference between Amazon Echo and Echo Dot? The Echo Dot is equipped with the same functions as the Amazon Echo. However, it lacks the 360-degree speakers. The Echo Dot work does work as a standalone product, though, and can serve as an extension of Echos in other rooms. Sound reproduction is possible via line-out or a connected Bluetooth speaker, and an external speaker should definitely be used for listening to music. Amazon's digital assistant, Alexa, is the brain behind the Echo. Alexa has what Amazon calls "skills," or the ability to do certain tasks via apps. This provides information from Wikipedia, plays music from Amazon Music, Spotify and other services, and is open to APIs from other products, meaning developers are able to integrate Alexa functionality into their own devices and software. The Amazon Echo is available now in black and white versions for $179.99, while the smaller Amazon Echo Dot will is available for $49.99. The process of setting up the Echo and Echo Dot are almost exactly the same. After unpacking and plugging everything in, you connect the device to WiFi via the Amazon Alexa app on your smartphone. In the settings, connect your new device with your Amazon account. Enter your WiFi password manually (no copy-pasting). Once you do that, you're ready to log into all of your secondary app accounts, like Spotify. Once the Echo and Echo Dot are set up, you can start using voice commands. To initiate a command, the activation word is "Alexa" (or you can set it to Amazon or Echo as an alternative). Once you say "Alexa," the device is ready and waiting for your command. It is a lot like using Siri or Google's assistant. The device has seven mics to enable its speech recognition. In our review, we noticed it was helpful to add a small pause between saying "Alexa" and the command. If the device is next to a wall, the sound of your voice will bounce a bit and the device won't know which direction you're coming from, but this didn't have any effect on the results. The voice recognition was always flawless. When the voice recognition is active, Amazon records all the sounds in the environment and streams this information to the Alexa Voice Service in the cloud, where the conversion to text takes place. The text is then forwarded to the provider of the desired "skill". This then provides the answer and lets Alexa speak on the Echo or perform the relevant task. There's a mute button that switches the light ring on the top to red, and this indicated that the Echo is no longer listening for the activation word or commands. Alexa can perform tasks like setting an alarm clock, reading texts out loud, or searching and relaying back information from the internet. Prime members get access to Prime Music, Amazon's music streaming service. Alexa is capable of doing quite a few things right our of the box, but things get really interesting when you add third party skills into the mix. Skills are like apps, third party functions that developers can create to work with Alexa and make your device more useful, fun, or interesting. Spotify is a main example of one of Alexa's available skills, and there are plenty more. You can order Domino's pizza, improve your drink mixing skills with Bartender, and even call for an Uber. Alexa makes a good cooking assistant, too. Not by stirring, but by telling you all of the steps to a recipe and listing ingredients. To use a skill, say "Alexa, open ___," and it will initiate. The possibilities get particularly exciting when you consider all the smart home solutions that Alexa works with, like Philips Hue lights, intercoms, thermostats, fans and outlets. We didn't have any smart home devices to test it with, but it seems like the control functions would work well. Asking Alexa for information often led to unhelpful answers. Sometimes she doesn't understand the question, or cannot find the information. Sometimes simplifying the question can help, but often the answer she comes back with is insufficient. What may be the most important aspect of Alexa is the quality of the speech recognition and output. Amazon ensures the quality of the Echo's speech recognition by having seven microphones around the device which can tell what direction commands are coming from and cancel out background noise and echoes. It also uses algorithms that become better after use and adapt to an individual's voice, much like how your smartphone's keyboard learns your typing habits over time. Amazon mastered the speech recognition excellently. The more you use it, the better it gets. Over the past two weeks of reviewing the device, it has picked up new terms and become smarter. The voice output sounds surprisingly natural. Amazon is constantly improving Alexa's voice, and it remains a few steps ahead of other platforms. The Amazon Echo is a full-fledged Bluetooth speaker that can play music from your smartphone or tablet. It's designed to be a 360 degree speaker, but not a full sound system. The audio quality and volume level is solid for casually listening to music, but cannot compare to a home cinema system or the like. The Echo Dot is much more compact and has a built-in speaker, but it doesn't provide good sound. If you want to ask Alexa for information, it's fine. If you want to listen to music, you should use external speakers. You can connect easily to a HiFi system with the Echo Dot. Let's say you have an Echo or Echo Dot in each room connected to your home network. Only the Echo you're speaking to responds to your commands. But what if there's more than one person using the Echos, and all the people in your home have their own Amazon accounts? In this case, all of your Echos are linked to a main account, but later you can select another account for specific devices. That way, you can use your own Spotify account in your bedroom, while your children can have their own in their rooms, for example. Switching between accounts quickly via voice recognition isn't currently available though. All of the commands you issue to Alexa are stored in the cloud and analyzed by Amazon. The voice recognition improves over time because of this, but also there is some concern over privacy. Over the course of time, a lot of information about you is collected. The constant listening may make some users uncomfortable, which is something to consider before purchasing a device such as the Echo. After activating Alexa, a recording of the command is sent to Amazon's servers, where it is analyzed and stored. The recognized commands are then sent to third parties, who will evaluate and maybe store the data. Amazon's servers will have an extensive record of information about your usage. Despite having Alexa in common, the two devices are very different. The Amazon Echo can be used alone and is capable of filling a room with music. It doesn't integrate well into environments where you already have a full sound system, since it is only one unit. The Amazon Echo Dot can forward audio to a HiFi sound system, so it works better in environments where you already have a full sound system in place. The small speaker in the Echo Dot is suitable for voice control, but is too low quality for playing music enjoyably. This review isn't just about the Echo and Echo Dot. It's also about the platform behind it, which is quite powerful. Alexa not only controls music, it's capable of controlling the entire smart home. And the platform is capable of expanding through third party vendors developing their own skills. This is just the beginning of Alexa's potential. What are your thoughts on the Echo and Echo Dot? Would you want one for your home? "Newest Family Member?" Gosh, "Alexa" has been a member of our family since beta, on November 6, 2014. She's almost two years old now, and she acts it sometimes! She truly is a "member" of our family, as we are constantly asking her to play music, water the garden (Zone 3 on Rachio) for 10 minutes, playing Jeopardy J6 and getting the latest weather. She has matured so much since those early months in beta, and she is constantly adding new skills! Here are a few tips: 1) Get the remote. We have a two story home. With the remote, we can control her from upstairs. 2) Get the app on your smartphone and tablet. I have a Samsung Galaxy Note 5 (non-exploding) and two Kindles. We are constantly going to the app for either more information, or to check her music queue. It seems the Kindle app has more functionality and information, as you might expect. 3) Make sure to use her "to-do" and "shopping list" functions - they are real time savers, especially when you are on the run! And of course, she keeps everything in sync. 4) ALWAYS start your command with "Alexa, (command)." I can't tell you how many times my dear Beloved gets frustrated because she'll ask a question and put "Alexa" in the middle of the command. And then she'll you hear the "Ba-Lunk" and the blue light flash (command not recognized). 5) Finally, make sure to give feedback to Amazon on how she is doing via the smartphone or tablet apps. Although all our feedback was really important in the beginning, and she has matured so much, it is helpful to the developers to receive your feedback. We have purchased a couple Echos for family and friends, especially for those who are alone (widows or widowers). Both are in their 80's, and Alexa has become a "member" of their family since she is always there and always on. OBVIOUSLY, the best interaction is HUMAN, but she has really helped during a difficult time for both. It has been a lot of fun for us to have "Alexa" in the house, and she is always a topic of conversation when we have friends and family over. Plus, she is smart as a whip, and she keeps getting smarter!